Please refer to our stock # 1-0409 when inquiring. 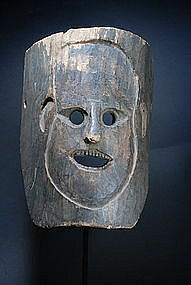 Highly unusual mask, which has kept the original shape of the tree trunk from which it was carved. The mask itself is carved in a kind of "reverse relief", its features hollowed out, except for its nose. One round hole at ear level on each side. Wood, with brown semi-glossy patina. Himalayan Region, early 20th century. Height: 12" (30 cm). The mask is nicely mounted on a custom metal stand which enhances its strange beauty. Erosion on some areas (forehead, nose and chin), otherwise very good condition. Note: this piece is part of a series of masks which were collected in the region from 1974 to 1979. Rare Himalayan Mask, Early 19th C. Highly Unusual Himalayan Mask, 19th C. Important Himalayan Mask, Nepal, Early 20th C.